Educational games for kids are becoming quite popular. These games are specially created to offer your kid to learn in a fun interactive way. However, among so many of these games finding the perfect one to keep the attention of your kid is not easy. Luckily for you, we searched and we discovered an exciting and fun educational game for kids to learn their favorite nursery rhyme songs while they enjoy singing and dancing in the same time - Nursery Rhymes DJ – KinToons. 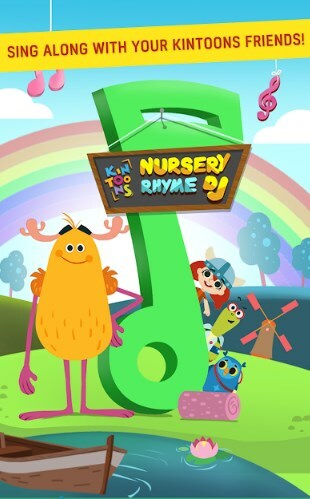 What is Nursery Rhymes DJ – KinToons? This kids’ educational game is developed on Android platform as one very unique, exciting and fun talking and singing game that is easy to play and suitable for all the kids to learn nursery rhyme songs. With simple controls, cute graphics and adorable characters, parents can choose for their kids any of the nursery songs to learn and choose the character they like to sing those songs in any order they want. With this kids’ game, toddlers will dive into the musical world of nursery rhymes, learning while they enjoy dancing and singing. Nursery Rhymes DJ – KinToons offers the kids a unique way of learning with a suitable gameplay based on phonics games to help the kids learn their favorite nursery rhymes. On the game, each kid will learn his favorite tunes in an interactive and immersive way and all that with expressive and adorable characters that have funny expressions set in a unique universe where they sing, talk and much more. To make it more interesting for the kids’, this game is offering vibrant voice-overs and each nursery rhyme songs can be played in any of the available characters voices in any order the user chooses for more fun. To keep the attention of kids, multiple educative environments are provided, the first two are free and others can be purchased. Each platform has its own elements that can be interacted to give happiness points and when the happiness bar is filled you get to see the magic. Offering 4 loveable characters, 3 nursery rhymes in 4 different voices and multiple enchanted backgrounds, this game will let kids enjoy singing and dancing while learning their favorite nursery rhymes at the same time. Download this app on Google Play for free to help your kid learn nursery songs while singing and dancing!